It was more than art . . . It was their legend . . . It was their life . . . It still is more than art . . . It is your connection with the ages . . . There is a haunting yet peaceful expression on the face of Demeter. She was discovered in 1953 by divers collecting sponges from the depths of the Aegean Sea. The rusty bronze fragment of a once beautiful and compassionate goddess was lying on the sea bed 120 feet below the surface. Demeter was the goddess of agriculture and the harvest. Her only daughter, Persephone, was a happy child who grew to be a stunningly attractive young woman who caught the eye and affection of Pluto. He abducted her and carried her off to the underworld where she became his captive wife. In her anger, Demeter prevented the earth from producing any crops threatening its very existence. Zeus had to intervene and ordered Pluto to send the lovely daughter home. Cunningly, Pluto tricked her into eating a pomegranate seed which bound her to the underworld forever. A contract then had to be agreed upon which allowed for Persephone to live for 8 months in the upper world with her mother; but 4 months she had to return to the underworld to live with Pluto. 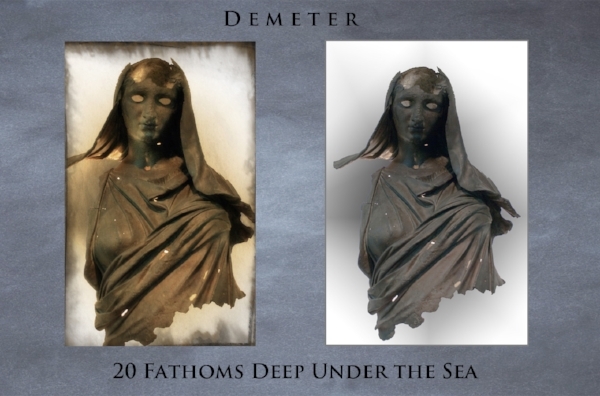 How ironic that the beautiful Demeter herself would spend many centuries in her own “underworld” twenty fathoms deep in the Aegean Sea. Naples Florida Festival of the Arts!!! We could not be more excited than we are about participating in the 29th Annual Downtown Naples Festival of the Arts on March 18th and 19th. What an honor to be involved in such a Great Art Festival. Though exhibiting at the Festival is certainly the highlight of our spring, I can't say that getting a bit of that Florida sunshine isn't adding tremendous anticipation to our rain-drenched Seattle bones. Florida sunshine and beautiful warm days - we are ready for you! Every work of art has a story. Never has that been more true than in the case of ancient art. It truly was not just art. It was monuments, it was memorials, it was depictions of their every day life, or honor to a cultural hero, or humanizing of mythological gods and goddesses. This blog is devoted to bringing that story to life. The work of ancient artisans is oftentimes at great risk of being destroyed through natural climatic events or through the careless acts of mankind. Stone Theater wishes to preserve images and stories of some of the greatest artisans of the past. We believe it is our connection to the timeless art of the ages.